Hong Lei is an artist and a curator. Photography is a common language amongst different places and groups of people. Since its invention, it has greatly influenced the life of every individual. From the moment it was born, photography has left a deep mark on historical representation, becoming a narrator and carrier of modern, global civilization. In today’s globalized vision of the cultural landscape, the art of photography is playing a greater role in the evolution of every culture. The art of photography connects these artists from different countries and eras. These works connect the individual impressions of the artists, highlighting important moments in the past and present of photography. 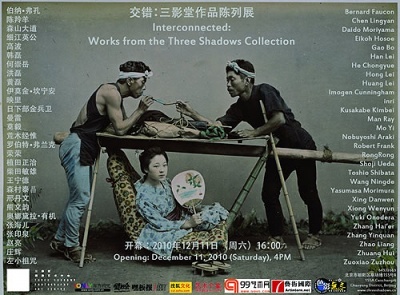 The exhibition contains works from the Three Shadows Photography Art Centre’s permanent collection and the personal collections of the artists. This unique blend of collections represents the most important values of photography art, namely the image’s aesthetic appeal and the true. Through these works, viewers can also gain a more objective and complete understanding of Chinese contemporary arts’ development and course of growth. Showing Chinese contemporary photography with the work of older European,American, and Japanese photographic masters provides a way to connect Chinese contemporary photography and international photographic culture. The exhibition makes apparent each different image tradition’s uniqueness, exploring the value of the image in this era of rapidly changing history and envisioning the use and significance of photography in the society of the future.